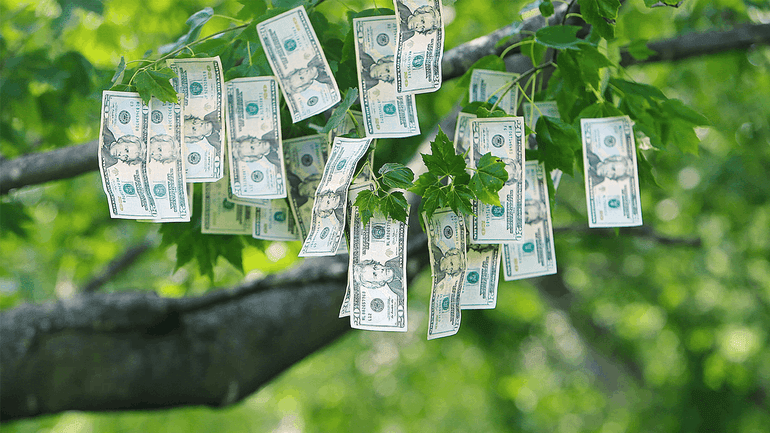 Does money really grow on trees? If you home has mature trees then you could be sitting on thousands of dollars. According to the Council of Tree and Landscape Appraisers, a mature tree could be worth between $1,000 to $10,000. Mature trees also do a lot for your home. If your home has mature trees in the yard your home value can increase to 19%. Mature trees can increase the sales price of your home in urban areas. Money Magazine said that landscaping can bring up to a 200% return at selling time. If your home doesn’t have mature trees it is best to plant as soon as you can as trees take years to mature in size. The Arbor Day Foundation has noted the best areas to have trees during the summertime are West and Northwest to provide great shade in the mid-late afternoon. Also planting trees around patios and driveways will help to keep you cool during the hot summer daytime. Another great way to keep your air conditioner cooler and running efficiently is to plant a tree near it to provide shade. During the winter months, it is best to plant conifer trees on the Northwest area of your yard to block winter winds. Planting deciduous trees around your home will help to provide sunshine to shine through during the winter months to warm your home. 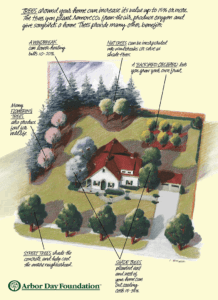 Where you live and what type of soil you have will all determine what types of trees you can plant. 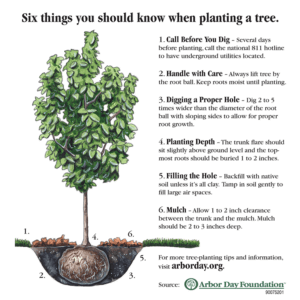 The Arbor Day Foundation has a great tree and shrub look up for the specific area you live in. When deciding to plant a tree don’t forget to call 811 before you dig. Consulting a landscaper before planting any trees or shrubs will help to prevent overgrowth and damage to your property.